NetEnt introduced a new enchanting slot i.e. Secrets Of Atlantis. This slot game theme is based on the well-known sunken city from the Ancient Greek mythology and is going to be loved by casino players for its mysterious rewarding bonus features. However, it has very ordinary graphics but has electrifying music which has added some spark to the theme of the slot game. 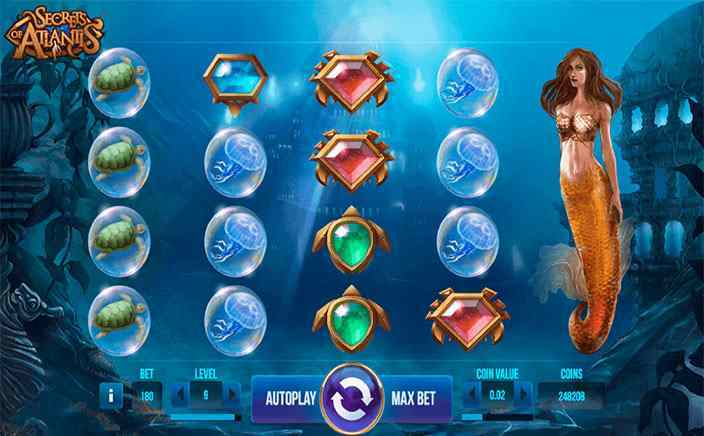 Secrets Of Atlantis slots feature 5 reels, 4 rows and 40 active fixed paylines; and through the translucent reels, there’s the distant view of the ruined buildings along with the distinct synthesiser soundtrack which accompanies during the gameplay. The players can play this slot with a minimum bet of £0.20 per spin and a maximum bet of £200.00 per spin. The symbols of this slot game are very beautifully crafted and relate to the theme. The symbols can be recognised as blue, green and red gems, crabs and a pearl in the oyster shell, jellyfish encased in the air bubbles and turtles. Moreover, combinations can be formed from the left to the right as well the right to the left. The stacked mermaid is the wild symbol of this slot. This symbol can cover the whole reel and to form a winning combination this symbol can replace all other symbols. The wild symbol occupies the dominant position in this slot game. Moreover, when the reels get to stop and if this symbol only appears partially in the view then it will be either poked up or maybe poked down to completely cover an entire reel. Some of the places on the reels 2, 3 and 4 have the lighter backdrop and if the players can land all the 3 of those along with that backdrop then they will be able to activate this feature. Moreover, the block of the symbols measuring 3×4 get transformed into the big random symbol and the players will receive 1 free spin, which will help the players to make a big win. Also, if the players can reiterate the lighter backdrops during the spin then they will be granted with one more free spin and this will continue till the players reiterate this process. 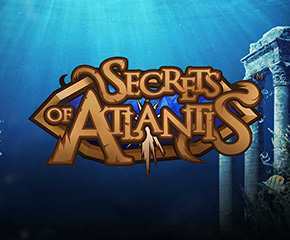 Secrets Of Atlantis slots is one of the high-quality game developed by NetEnt. This slot game has attractive bonus features which make players addictive to it. Also, it has a moderate variance and one can earn a hefty amount by playing it sensibly. It has a decent return to player percentage of 97.10%.